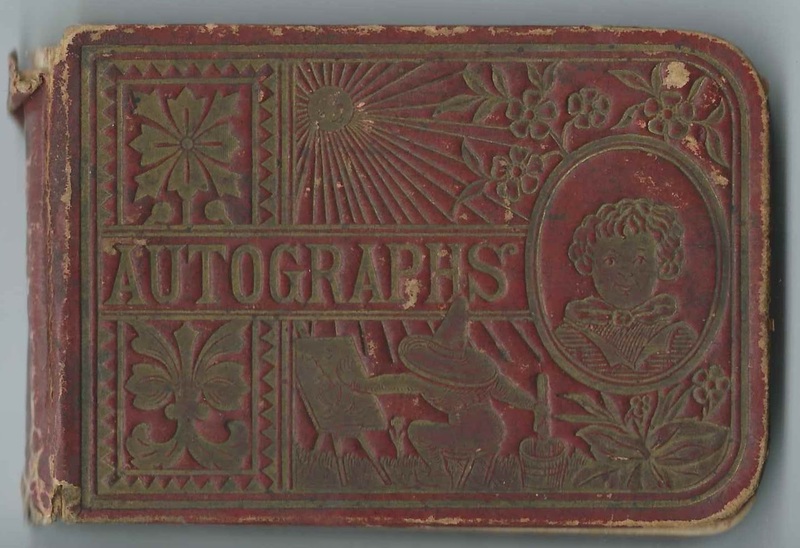 1880s autograph album that belonged to Sarah B. Siebert of Canada, Kansas. Canada, Kansas got its name from the numerous Canadian natives who settled there, Sarah being one of them. Sarah inscribed several pages throughout the album. The facing pages shown below are the inside front cover and the first page of text present - there may have been pages that are lost. The welcome page is the next present page of text. Sarah's confusing use of "S"s occurs throughout most of the pages she inscribed. 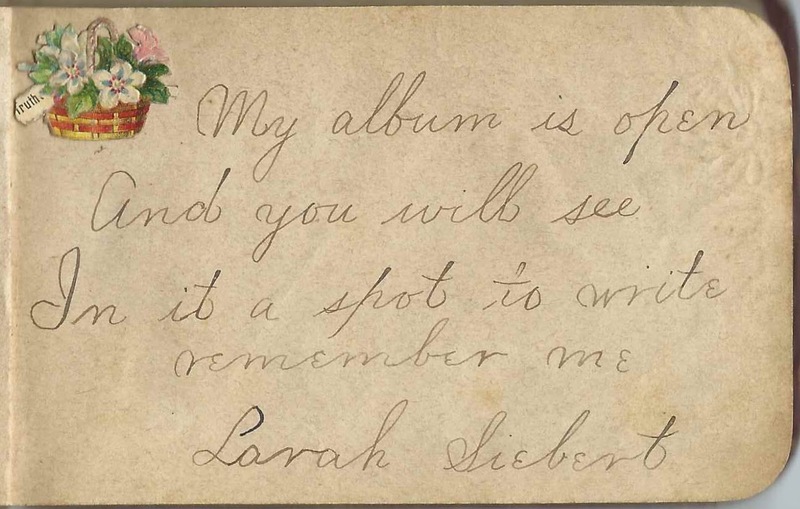 The album measures approximately 4-1/4" by 2-3/4" and contains the sentiments of nearly 40 people, though some of those who called themselves Sarah might have been Sarah B. Siebert herself. An alphabetical surname list and an alphabetical list of the inscribers, together with any personal information they offered, appear at the end of this post. Sarah B. Siebert was born about October 1875 in Canada, the daughter of Christ Siebert and Barbara (Yagge) Siebert. 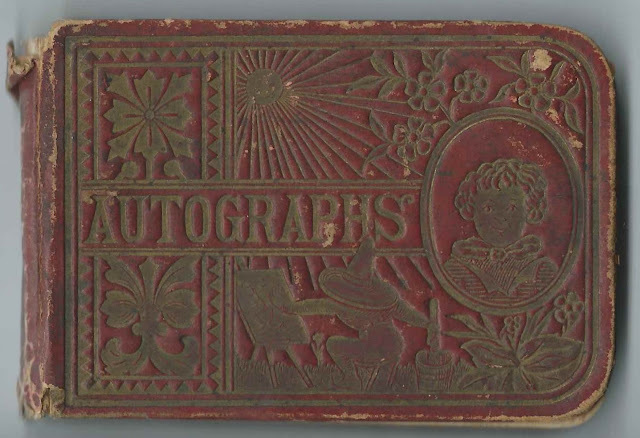 Several of Sarah's siblings inscribed pages in her album: sisters Edith, Maryann; and Matilda. According to an article in the March 13, 1896 issue of the Marion Record newspaper, John Siebert and the "Misses Clara and Sarah Siebert" suffered a carriage accident while returning from church. Sarah was the most seriously injured. I believe it was this Sarah B. Siebert who married Lee Bruce Swinford and moved with him to Washington State, where they had at least two children. If you have more information on Sarah Siebert and her later life, please leave a comment or contact me directly. K Kannengiesser T Tobin ? Agnes; inscribed on January 22, 1889 at Canada, Kansas. Matilda Kreutziger; middle initial might be C or E.
Sarah B. Siebert, "Sally", of Canada, Kansas; she inscribed her name and messages on several pages. 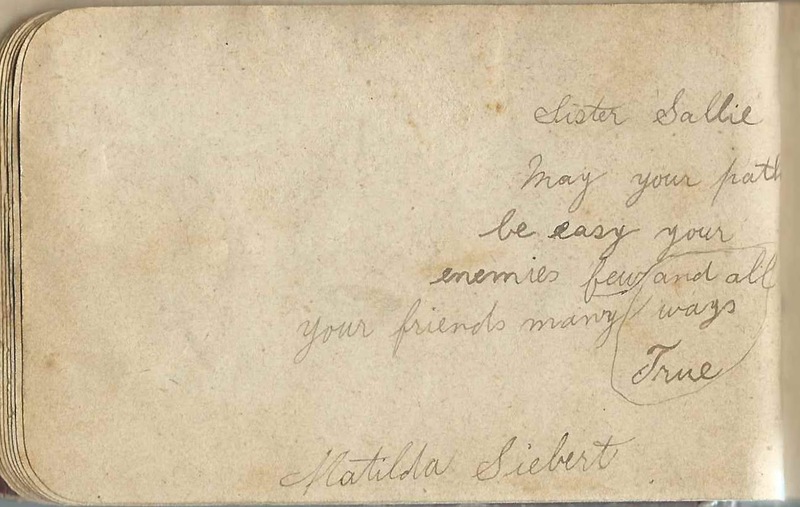 Eli Siebert; middle initial too faint to read, but possibly C.. Sarah Siebert's brother. L. Tobin or Tobia or ? Angeline M. Wismer. She would marry Sarah Siebert's brother John Siebert.